CNX AUTO index closed the week on positive note gaining around 3%. As we have mentioned last week that if the index manages to close above the levels of 8650, the index will break-out of the 3 months consolidation and the index can move to the levels of 8800 and the index hit a high of 8862 before closing the week around the levels of 8795. 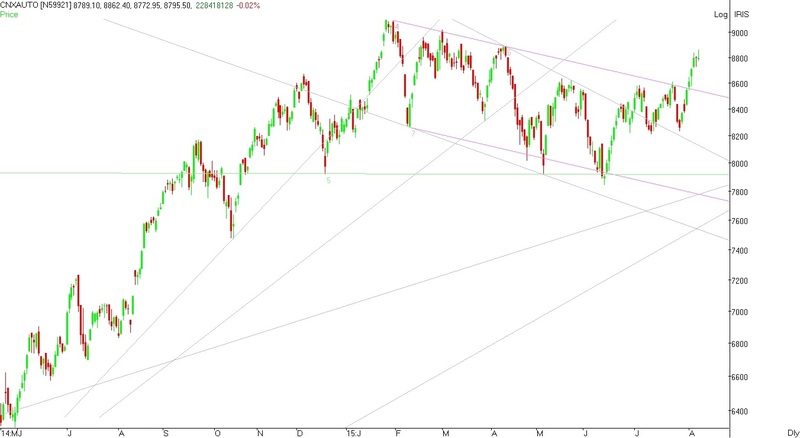 The index has formed a Shooting star pattern on daily charts on 07/08/2015 indicating the trend reversal in an uptrend. If the index manages to close above the levels of 8862 the index can move to the levels of 9000. Support for the index lies in the zone of 8600 to 8700 from where the index has broken out and also short term moving averages are positioned around this levels. Resistance for the index lies in the zone of 8650 to 8700 above which the index can move to the levels of 9000. Broad range for the index is seen from 8550 to 8600 on downside to 8900 to 9000 on upside.